Title: 04/30/1996 - Information on Temporary Workers. This is the second response to your letter of November 13, 1995, in which you requested information on temporary workers, particularly those in the electronic assembly industry and office workers like Kelly Services. This letter will address health compliance issues, personal protective equipment (PPE), recordkeeping, and training (your questions #2, 3, 4, 5, 6, 8, 9, and 10). Please keep in mind that these situations are very heavily fact-based; much of the interpretation depends upon the specific facts and circumstances of a particular situation and workplace. The employees who work through employment agencies are generally called "temporary," "leased," or "supplied" workers (referred to in this letter as temporary workers). These employees are supplied by a "temporary," leasing," or "supplying" employment agency who is their employer (referred to in this letter as temporary agency employer). This employer enters into contracts with secondary employers generally called the "host" or "client" employer (referred to in this letter as host employer). Question #2. What training must be provided to temporary workers by the host employer? Can general safety training provided by the supply employer such as chemical safety, material handling (lifting, push/pull, holding, carrying), hazardous energy control, ergonomics, etc. provided by the temporary agency/subject employer be supplemented with job-specific safety information? If the host employer provides this training, does this increase their responsibility/liability under the OSH Act since the temporary workers would be under their "direction and control"? Answer #2. The Occupational Safety and Health Administration (OSHA) considers temporary agency employers, who send their own employees to work at other facilities, to be employers whose employees may be exposed to hazards. In situations where a temporary agency employer maintains a continuing relationship with its employees, but the host employer creates and controls the hazards, there is a shared responsibility for assuring that the temporary workers are protected from the workplace hazards. The host employer has the primary responsibility of such protections, but the temporary agency employer likewise has a responsibility under the OSH Act. The general rule is that the temporary agency employer would be expected to provide some generic training and the host employers would be responsible for providing site-specific training, or training to update employees on new hazards in the workplace. In meeting the requirements of OSHA's Hazard Communication Standard, the temporary agency employer would, for example, be expected to provide generic hazard training and information concerning categories of chemicals employees may potentially encounter. Host employers would then be responsible for providing site-specific hazard training pursuant to sections 1910.1200(h)(1) and 1926.59 (h)(1). The host, of course, may specify what qualifications are required for temporary workers, including training in specific chemicals or personal protective equipment. Contracts that the temporary agency employer has with host employers should clearly describe the responsibilities of both parties in order to ensure that all requirements of the regulation are met. Primary responsibility for controlling potential exposure conditions would, of course, generally remain with the host employer. Question #3. How intensive must this training be considering some temporary workers may only be assigned to that employer for a few days? Since training is a process, not all training could be provided even within a few months. Does OSHA's compliance directive recognize this? Answer #3. See answer to Question #2. OSHA's compliance directives do not address this issue. Question #4. If the temporary worker is assigned to tasks which require medical monitoring, who is responsible for this: the host employer or the temporary agency/supply employer? Answer #4. The host employer must offer and perform the required medical surveillance or evaluations. The temporary agency employer must ensure that the records of the required medical surveillance or evaluations are maintained in accordance with the appropriate OSHA standards. Question #5. How are the access to medical information and industrial hygiene test exposure data affected by the temporary worker-host employer relationship? Answer #5. The temporary agency employer is required to maintain employee records in accordance with the appropriate OSHA standard. However, the host employer must perform the site characterization and monitoring of exposure to hazardous chemicals on the worksite. Question #6. What obligations are there for the host employer to provide personal protective equipment (PPE) to temporary workers? Although the requirement to wear PPE for certain tasks would still apply, is this a reasonable cost to be incurred by the host employer? Can the requirements for PPE be contractually transferred to the temporary agency employer? Answer #6. Host employer is responsible for providing PPE for site-specific hazards to which employees may be exposed. The host or supervising employer has the responsibility for assuring use of the PPE. However, again, the host employer may specify the services that it wants the temporary agency employer to supply, including provision of PPE for the temporary workers. Contracts with the host employer should clearly describe the responsibilities of both parties in order to ensure that all requirements of OSHA's regulations are met. OSHA standards also cover lockout/tagout of hazardous energy. Get your circuit breaker lockout supplies and kits at Safety Emporium. 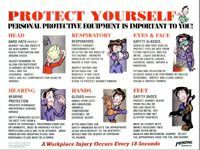 Another issue regarding PPE is: who will pay for the PPE. The general rule is that the host employer would be responsible for the employee's PPE. However, if the host is not paying for the PPE, then the host has to assure that the supplying employer will provide it. Any training associated with the PPE would also follow this general rule. OSHA has interpreted its general PPE standard, as well as specific standards that are silent on the issue of who pays for PPE, to require employers to provide and to pay for personal protective equipment required by the company for workers to do the job safely and in compliance with OSHA standards. Where equipment is personal in nature and can be used by workers off the job, the matter of payment may be left to labor-management negotiations. However, shoes or outerwear subject to contamination by carcinogens or other toxic or hazardous substances which cannot be worn offsite must be paid for by the employer. Attached is a copy of a memorandum dated October 18, 1994 from former Deputy Assistant Secretary James W. Stanley to the OSHA Regional Administrators that discusses the employer's obligation to pay for PPE and is currently OSHA's policy on the subject. If you wish to discuss the issue of PPE further or have any questions, please contact Russell R. McCollough at (202) 219-8041 x129. Question #8. How should recordable injuries and illnesses be documented on the Log and Summary of Occupational Injuries and Illnesses (OSHA 200)? Is it acceptable to maintain a separate log of temporary workers' injuries and illnesses? What protection is provided to employers since temporary workers are under no requirement to notify the host employer of such injuries/illnesses but can notify OSHA of an unsafe condition or practice or that they were injured at a particular host employer? Answer #8. Businesses who use workers from temporary agency employers on a contract basis must record those workers' occupational injuries and illnesses when the host employer provides their day-to-day direction (supervision). See pages 24 and 25 of the Recordkeeping Guidelines for Occupational Injuries and Illnesses. Question A-2 addresses the use of workers from a temporary agency employer on a contract basis. The answer states that the records should be kept by the firm responsible for the day-to-day direction of the employees' activities. If the host employer supervisor supervises the details, means, methods, and process by which the work objective is accomplished by the temporary workers, the host employer would be responsible for recording the injuries and illnesses of the temporary workers. The determining factor for recordability is the day-to-day supervision of the employees. In short, the responsibility for recordkeeping is no different than the responsibility for training or any other OSHA requirement. The company that has direct supervision over the day-to day activities of employees is responsible for maintaining the injury and illness records for those employees. Workplaces with 11 or more employees may have to comply with OSHA 300 work-related injury reporting requirements. Get your compliance materials at Safety Emporium. Some temporary agency employers, however, may be exempt from OSHA recordkeeping requirements as an employer classified in a low-hazard industry and are not required to record occupational injuries and illnesses on the OSHA Form 200 unless prenotified in writing by the Bureau of Labor Statistics. See pages 4 and 5 of the Guidelines. A host employer may sub-divide the log to provide separate listings of temporary workers but must consider the separate listings to be one log for all purposes, including access by OSHA and workers and for the annual summary and posting. Many employees will not report workplace hazards, injuries, or illnesses to their employer for fear of discrimination/blacklisting by the employer. The OSH Act does not require any employee to notify any employer of any hazard, injury, or illness. When OSHA receives a complaint from an employee alleging unsafe or unhealthful working conditions, the complaint will be responded to in accordance with OSHA's current policies regardless of whether the complaint came from a "regular" employee or a temporary worker. Question #9. How should cumulative trauma disorders be recorded? Although the musculoskeletal disorder may become apparent while assigned to a host employer, due to the cumulative nature of these disorders, how can that adequately represent the injury/illness experience of the host employer? Answer #9. See pages 14 and 15 of the Ergonomics Program Management Guidelines for Meatpacking Plants (OSHA 3123, 1993) (copy enclosed) regarding the recording of cumulative trauma disorders (CTD). CTDs should be recorded by the employer that has control over the temporary worker's day-to-day activities. If workplace activities supervised by the host employer contributed to the cumulative trauma disorder, then the disorder should be considered work-related and entered into the records if it meets the criteria in the Meatpacking Guidelines. Question #10. If a serious injury should occur and is required to be reported to the local OSHA office, who is responsible for reporting this occurrence? Answer #10. According to 29 CFR 1904.8 the employer of any employee so affected is required to orally report (by telephone or in person to the OSHA Area Office that is nearest to the site of the incident, or by using the OSHA toll-free central telephone number) any fatality or inpatient hospitalization of three or more employees. Again the employer who has control over the temporary worker's day-to-day activities would be responsible for reporting to OSHA. If you wish to discuss recording issues further or have any questions, please contact Stephen A. Newell, Director, Office of Statistics or his staff (Jim Maddux, David Schmidt, or Bob Whitmore) at (202) 219-6463. You may also wish to look at OSHA's standard on permit-required confined spaces (29 CFR 1910.146), which puts several requirements on host employers. Besides the initial determination requirement of paragraph (c)(l) of 1910.146, the host employer must comply with the five requirements of paragraph (c)(8) when engaging another employer (contractor) who will have employees in permit spaces under the control of the host employer. See enclosed Federal Register copy of the final rule, page 4491 of the preamble, and page 4552 of the standard. If you have any questions, please contact Helen Rogers at (202) 219-8031 x121.